I enjoyed a wonderful evening last night teaching about kosher couponing at Springfield, NJ’s Congregation Israel. Thank you so much to the Sisterhood for sponsoring my visit. You were all so welcoming and kind! As promised, here is a list of resources to help you continue on your money-saving journey. The KOAB Coupon Database is your go-to resource for finding coupons to match-up with all your local sales. And here is a helpful post on “Coupon Abbreviations“, like SS = SmartSource. We talked about deal match-ups – and the importance of using frugal bloggers to make your lives simpler. 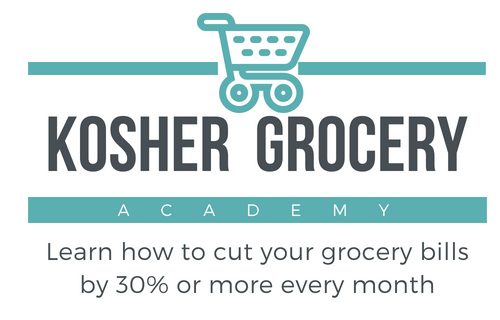 Each week, I provide the kosher match-ups for Target, Whole Foods (bi-monthly), CVS, Walgreens and Walmart. I also encourage you to follow a local New Jersey deal blogger, who does the sale/coupon match-ups your stores like Shop Rite, Stop ‘n Shop and others. I suggest that you start by checking out Living Rich with Coupons. If you are new to deal-shopping at the drug stores, please read my CVS Tutorial and Walgreens Tutorial to get you started. I know I covered this rather quickly, so here is my tutorial about my no-clip coupon organization method – and a follow-up post about how to organize printable coupons. Learn more about how stockpiling can save you money – and even allow you to give more generously, like I mentioned with my cake mix boxes! If you need more menu planning ideas, I share our plan every month. And here’s a post on how menu planning will save you money. Finally, if you’re not already, I hope you will stay in touch with me by “liking” the KOAB Facebook page and subscribing for the free KOAB daily email newsletter. Thanks so much for your wonderful presentation! It was eye opening!